Seed Snatcher Seed Snatcher| Gardening Seeds Tips. 'Our Seeds' is a documentary from Seed Savers that was filmed back in 2008. The nearly hour-long film has been screened all over the world and is now available on YouTube. In September 2008 Seed Savers released their first film, “Our Seeds: Seeds Blong Yumi”, a 57 minute documentary that celebrates traditional food plants the people that grow them. It has been fitted with Chinese Japanese and Portuguese subtitles. There are developed instructive motion graphics and a rich sound track, mostly indigenous music recorded on-location. Audio is English or Pacific Pigin. Subtitles are in English or French. “Our Seeds” has been shown several times on national television in American Samoa and Western Samoa, Papua New Guinea, Vanuatu and Solomon Islands. Excerpts have been shown on national television in Serbia, Malaysia and Taiwan and Portugal. Indigenous farmers around the world face increasing pressure from agribusiness corporations that push their uniform seeds. Many of these varieties require costly inputs such as pesticides and chemical fertilisers. This one hour documentary will help you if you are presenting the idea of a Local Seed Network in your region. Seed Savers directors, Michel and Jude Fanton, shot the film in eleven countries of Europe, Asia and Oceania. It features Pacific islanders who face great challenges: replacing innumerable varieties of root staples with modern hybrids that require pesticides and chemical fertilisers; importing low-quality starch thereby risking losing their resilient food crops. You can also buy the DVD of 'Our Seeds' from Seed Savers. After being popularized by guerrilla gardeners the seed bomb is a little ubiquitous. Which is why I'm currently digging these seed Bon Bons by Park Seed. The delicious take on seed bombs come in a variety of, um, flavors. Edible Flowers, Edible Tea Garden,Cocktail Herbs, Italian Herbs and the Culinary Basil Collection. Just as attractive as a box of chocolates, but these Bon Bons won't go to your Valentine's thighs. "This year we are going to charge for our catalog because we have it printed in the US not in China where it would cost about 25% of what it costs in the US. The charge is going to be $5.00. When we printed our Commemorative Catalog it disappeared in less than 6 weeks. We do not believe that this catalog will have quite the audience because it is not free, but we do believe that we will sell out. We are not planning to print as many catalogs, because there is a charge and many people just will not pay for a gardening catalog." The deluge of catalogs gardeners experience every spring and fall has conditioned us to see catalogs as something we should get for free. Can you charge for a seed catalog in an age when they're free and available online? I think so. Those of us charmed by the vintage gardening information included in the commemorative catalog will see a value in the 2012 catalog. 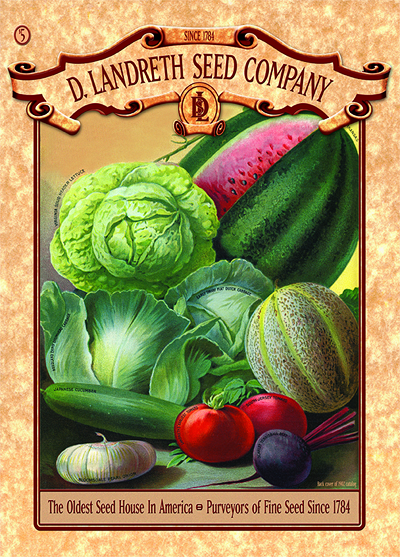 Order the 2012 catalog at LandrethSeeds.com or Call 1-800-654-2407.